A world-leading flight engineering simulator created by BAE Systems is ready to be “flown” by F-35 Lightning II pilots for the first time as they prepare for flight trials on the UK’s new Queen Elizabeth Class aircraft carrier next year. to fly the jet to and from the UK carrier. 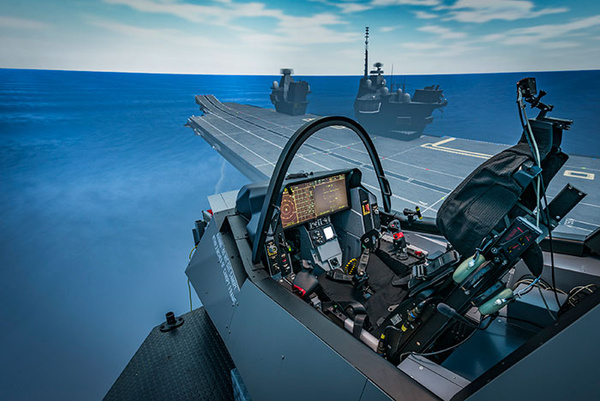 The refurbished simulator will test pilots’ skills to the limits as they practise landing on the deck of the new aircraft carrier in a range of difficult sea and weather conditions provided by the simulator. The 360-degree view for pilots is vital as potential obstacles on an aircraft carrier are often behind the pilots as they land. Over the coming months the simulator will be used by UK and US military test pilots who have experience of flying F-35s on US carriers. The pilots will practise thousands of ski jump short take-offs and vertical landings that use both the vertical thrust from the jet engine and aerodynamic lift from the wings, allowing the aircraft to take-off and land on the carrier with increased weapon and fuel loads compared to predecessor aircraft. Over the last 15 years, BAE Systems’ flight simulation has been used to support the design and development of the interface between the F-35 and the UK’s next generation of aircraft carriers.